I should not have been surprised, really. After all, everyone and their mom is creating a phone app for practically everything. 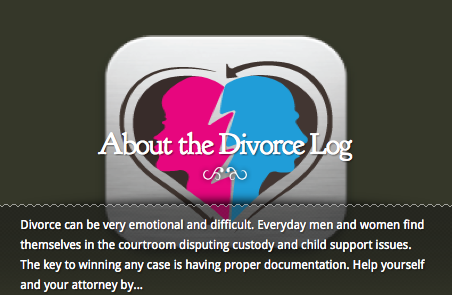 Why not create apps that will help people who are going through the messy process called divorce? Actually, what brought my attention to what I call “getting divorced apps” is an article by Michelle Maltais, who pointed out that there are several apps meant for this. The interesting thing is that the apps seem to be found only for iOS and Android devices. What that means, I will not even go into, but if you have some idle time, it can be a point to ponder. Anyhow, there is this app called Divorce Log, which plays heavily on the fact that documentation is the key to a successful divorce. That is, successful in a way that you do not get the short end of the stick at the end of the process. As such, this divorce app basically helps an individual going through divorce to document all things related to the process: from alimony, expenses, correspondence, and so on. Call it a high tech, mobile way of keeping track of the entire process. Available for both Android and iOS. If you’re on Android, and you are worried about how much alimony might cost you, Google play has something for you: Child Support Calculator. The useful feature of the app is that it takes different state laws in consideration when crunching the numbers.